I'm so happy that the weekend is here and I will be able to "Play" some more! This morning I made a birthday card for a young lady that used to come to my daycare! She is a teenager now so I couldn't make her a cutesy card. I was so excited when I found this digital stamp at Phindy's Place! It's always exciting when you find an image that actually looks like the person that you would like to make the card for! Philomena O'Neill is the very talented artist and her work is outstanding! 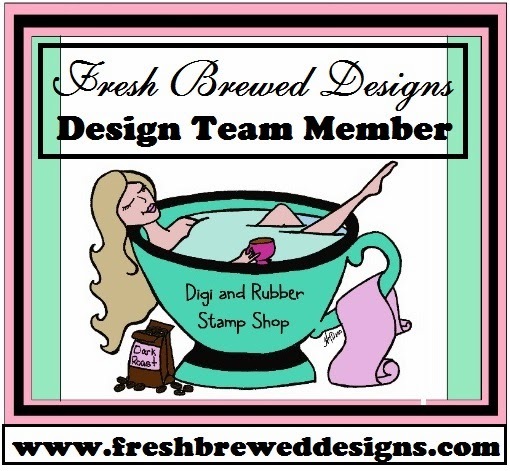 She has so many great digital stamps to choose from for every occasion! Phindy's Friday Challenge Blog has a SKETCH challenge, so I used their sketch while making this card so that I could join the challenge! Phindy's Friday Challenge Blog #58 SKETCHTIME! This is great! Perfect image for a teen girl, I agree with you, all the Phindy images are realistic, so fun that it looks like your friend! Love the fun dsp, pretty flourish and cupcake embellie. So cute all around, she will love it. Glad you joined us at Phindy's Place this week. Sheryl, you made a fabulous "teen" card with this image! Great coloring and I love all your little touches with the cupcake, the ribbon and the "bling". Thanks so much for joining us at Phindy's Place! I forgot to remind you Sheryl - you can post another link to your entry as you get counted twice for using a Phindy image! Hi Sheryl. Lovely take on our sketch this week. The dp works brilliantly with the image for a teen. Thanks for joining us at Phindy's Place. lovely card. thanks for playing along at Amber's Crafts and Stuff. Awh, Sheryl...this is great! I love what you did with this. Your take on the sketch is great! Thank you for playing with us this week at Phindy's Place!